Pictured: (L to R): Dean Jerris Hedges with Drs. Yoshihisa Asano and Larry Shapiro at the Memorandum of Agreement Signing Ceremony at JABSOM. Deborah Manog Dimaya photos. 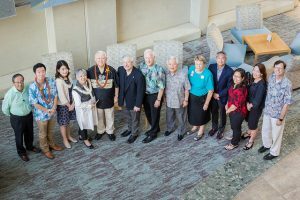 The Noguchi Medical Research Institute (NMRI) of Tokyo invests $1M towards a triple partnership with the University of Hawaiʻi (UH) medical school and University Health Partners of Hawaiʻi (UHP). 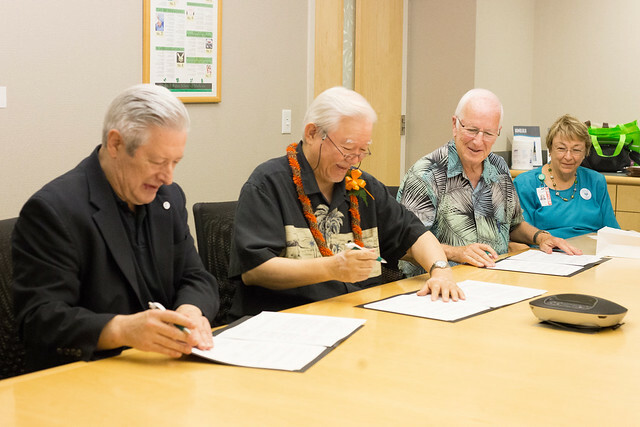 NMRI Founder Dr. Yoshihisa Asano, UH Medical School Dean Jerris Hedges and UHP Chief Executive Officer Dr. Larry Shapiro signed the agreement at the UH John A. Burns School of Medicine in October. 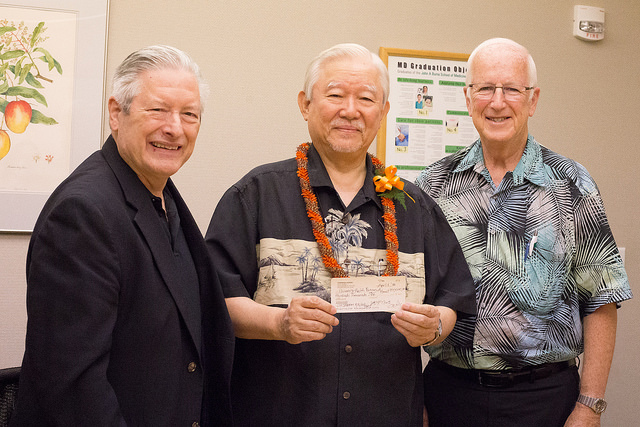 Awarding scholarships to two Japanese graduate medical trainees to be exposed to medical care and clinical skills in Hawaiʻi for up to one month, annually. Implementing a medical student training program, with consultation from NMRI Inc., that includes workshops that emphasize humanity and empathy. Developing International Conferences based in Honolulu, every two years, under the sponsorship of NMRI and other supporting parties. Representatives from NMRI, JABSOM and UHP gathered for the formal signing ceremony at the UH Kakaʻako campus. The NMRI is a non-profit organization, founded in 1983 in Philadelphia, named after Dr. Hideyo Noguchi. The mission of NMRI is to enhance medical exchange between the United States and Japan, particularly to support Japanese health care providers, mostly young physicians, to learn clinical medicine and education in the U.S. During the last quarter-century, NMRI has helped several hundred physicians and medical students to come to the U.S., especially the University of Hawaiʻi and Thomas Jefferson University. In 2008, NMRI celebrated its 25th anniversary. Dr. Asano is the NMRI founder and chairman emeritus as well as the President and CEO of Noguchi Medical Research, Inc. He is also a specialist in dietetics and worked for pharmaceutical companies before he founded NMRI with recognition of the importance of health care and medical education. He is a talented business manager as well as a scientist, and his capability has contributed significantly to the financial activity of NMRI. Without his effort and enthusiasm, NMRI could not have become renowned and established its identity.